NIDA offers a strategic set of funding mechanisms to support the development of research scientists through multiple stages of their careers. These awards are designed to ensure that scientists of the very highest caliber are available to meet the Nation’s need for drug abuse and addiction research. NIDA’s portfolio includes research in basic, clinical, and translational sciences. This includes genetics, epigenetics, molecular biology, neuroimaging, cognitive and social neuroscience, pharmacological and behavioral therapies, prevention, epidemiology, health services, health disparities, HIV/AIDS and other related domains. 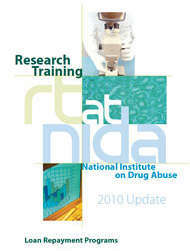 NIDA also promotes opportunities for quantitative scientists from fields such as mathematics, bioengineering, and physics to apply their knowledge to the study of drug abuse and addiction. Through cross-disciplinary training and a focus on emerging technologies and scientific opportunities, NIDA seeks to ensure a cutting-edge research workforce that will advance the knowledge base needed to combat these urgent public health problems. NIDA invites you to discover research training, research education, career development, and other trans-NIH opportunities for yourself and/or your mentees within these webpages. Should you have any questions about NIDA’s training programs or awards, please contact a member of the NIDA Research Training Committee. For questions pertaining to these training webpages, please contact the training officer. NIDA funded T32 programs are permitted to add new trainees within the last year of the program's funding with prior approval from NIDA. This policy will help to protect new trainees from a sudden lapse of funding within a relatively short period of time should the applicant's competing application not be awarded. Prior approval can be obtained under the following circumstances: 1) the new trainee(s) require(s) support under this mechanism for only a brief time, or 2) there is a contingency plan in place to provide continuous support for the trainee(s), should the competing application not be awarded. In either case, there should be no expectation that NIDA will continue to support trainees through the T32 program once the program's funding is finished. The procedure for obtaining prior approval will be a written request accompanied by a reasonable justification submitted to the assigned NIDA Program Official, at least 2 months prior to when the trainee will be appointed. Please be advised that this policy and requirements will be included in all T32 Notices of Grant Award. For a complete list of NIDA contacts on Research Training and Career Development mechanisms, please visit Research Training Committee.